Patria's AMV28A armoured wheeled vehicle has successfully completed swimming tests in Finland. Weighing 28 tonnes, the Patria AMV28A (28A stands for 28 tonnes) GVW amphibious (sea-stage 3) vehicle, is the latest member of Patria's AMV product family, introduced at IDEX 2017 earlier this year. 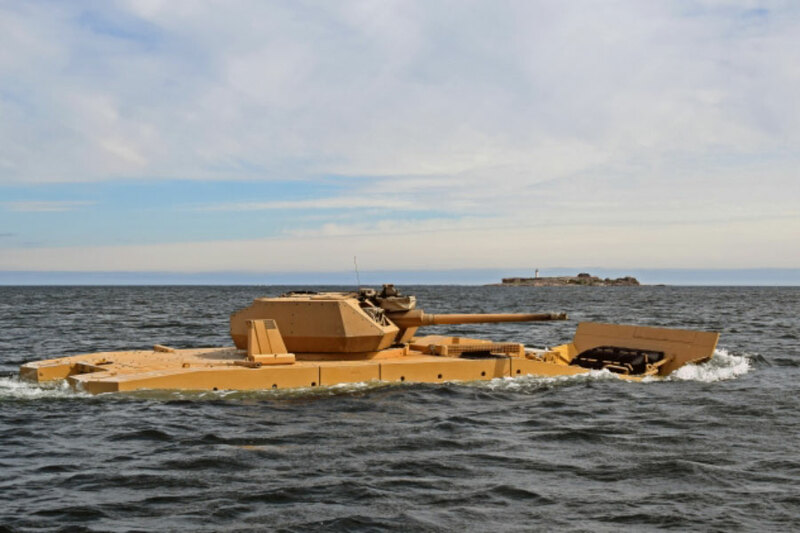 In the swimming tests conducted in late May, two different Patria AMV28A vehicles were tested —one in test configuration with full amphibious weight of 28 tonnes ,and the other equipped with the Kongsberg PROTECTOR MCT-30 turret with some payload capacity available. Patria says both vehicles had no difficulties completing the various amphibious tests at the Hanko area in southern Finland under strong wind conditions, with constant wind speeds of between 10 to 13 m/s, in gusts of more than 17 m/s. • Modular amphibious kit, easy to detach and rearm when needed.